This diverse group of crustaceans is scientifically known as the Anomura. It includes the hermit-crabs (families Diogenidae and Paguridae), squat lobsters (Galatheidae) and porcelain-crabs (Porcellanidae) amongst other less well known families. The name Anomura literally means "differently-tailed" and refers to the unusual abdomens that tend to be somewhat reduced in size, and flattened compared to those of shrimps and lobsters. 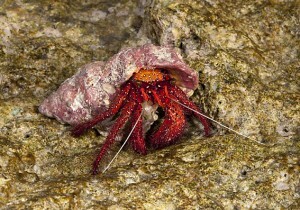 These abdomens are often carried as a broad flap tucked under the body, but in contrast, the hermit crabs have large fleshy soft abdomens that they protect by hiding them in discarded snail shells. Anomurans are found in a wide variety of habitats from the shoreline to abyssal depth. Elegant Squat Lobster (Allogalathea elegans) Spotted Hermit (Dardanus megistos): Northern Australia; also Indo-West Pacific.